The City of Glenwood Springs is a home rule municipality that is the county seat and the most populous city of Garfield County, Colorado, United States. The U.S. Census Bureau stated that the city population was 9,677 in 2012 as compared to 9,614 according to the 2010 census. Further growth is expected to be slow due to severe geographic constraints. Glenwood Springs is home to one of the campuses and the administrative offices of the Colorado Mountain College system. Glenwood Springs was named the "Most Fun Town in America" by Rand McNally and USA Today in their 2011 Best of the Road Rally contest. Its location at the confluence of the Colorado River and the Roaring Fork River as well as gaining a stop on the railroad historically made it a center of commerce in the area. 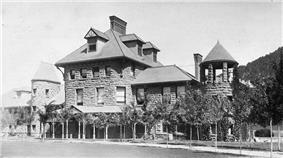 The city has seen famous visitors including President Teddy Roosevelt who spent an entire summer vacation living out of the historic Hotel Colorado. Doc Holliday, a wild west legend from the O.K. Corral gunfight, spent the final months of his life in Glenwood Springs and is buried in the town's original Pioneer Cemetery above Bennett Avenue. Infamous serial killer Ted Bundy was imprisoned in the Glenwood Springs jail until he escaped on the night of December 30, 1977, an escape which went undetected for 17 hours. Glenwood Springs was one of the first places in the United States to have electric lights. The original lighting was installed in 1897 inside of the Fairy Caves in Iron mountain. Eventually a dam was built in Glenwood Canyon providing water for the Shoshone power plant. The plant began producing power on May 16th 1909. According to the United States Census Bureau, the city has a total area of 4.8 square miles (12 km2), of which, 4.8 square miles (12 km2) of it is land and 0.21% is water. Glenwood Springs is one of the most walkable towns in America, a distinction that has been recognized by PBS and Walking Magazine. 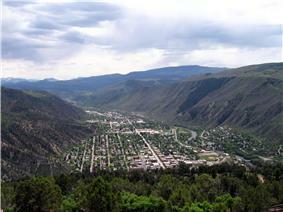 The town itself is situated in the river valleys at the confluence of the Colorado River and the Roaring Fork River. The area surrounding Glenwood Springs is steeply contoured on all sides with numerous caves to be found. 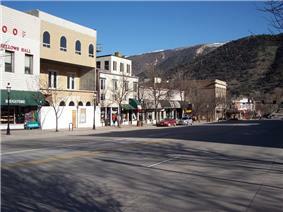 Glenwood Springs is the headquarters of the Roaring Fork RE-1 school district and the Colorado Mountain College. In all, the city has 5 public K-12 schools: Glenwood Springs High School, Yampah Mountain High School (an alternative school not part of RE-1), Glenwood Springs Middle School, Glenwood Springs Elementary School, and Sopris Elementary School. St. Stephen's Catholic Elementary School, which was founded in 1982, is K-8. Amtrak services regularly stop at Glenwood Springs, the second busiest station in Colorado, behind only Denver. The California Zephyr operates daily in both directions between Chicago and Emeryville, California (across the bay from San Francisco). Amtrak takes a scenic route through the mountains between Denver and Glenwood Springs. Much of the route follows the Colorado River and is away from roads and major development. Part of the route near Glenwood Springs was used for locations in the 1995 action movie Under Siege 2: Dark Territory, starring Steven Seagal. Roaring Fork Transportation Authority(RFTA, pronounced "rafta") provides bus transit in Glenwood Springs and throughout the Roaring Fork Valley. VelociRFTA BRT service, the first rural BRT in the USA, began in September 2013, offering connections between south Glenwood Springs and Aspen roughly every 15 minutes with a 60 minute total travel time. The city also operates an intracity bus service, Ride Glenwood. Ride Glenwood offers a main route from the west side of town along the 6&24 corridor, through downtown, to the south part of Glenwood along Hwy 82. Greyhound Lines also stops in Glenwood Springs on trips between Denver and Las Vegas. On June 25, 2014, Greyhound will extend the Denver-Las Vegas route into the New York-Los Angeles route, allowing passengers to ride from New York to Glenwood Springs with no need for transfer. The Denver-Las Vegas will still retain service once daily, but will be supplemented by two daily New York-Los Angeles runs, thus, Glenwood Springs will have thrice daily service in each direction, compared to twice daily under the old schedule. Also, Greyhound buses through Glenwood springs will all offer new amenities, including Wi-Fi, power outlets, and heavily-upgraded seating from Mexico with very high recline angles. Beginning in 2015, weekday bus service will be run by CDOT between Glenwood Springs and Denver. Glenwood Springs Airport, a municipal airport, was built in the early 1940s. Its airport code is KGWS. The airport was also named the 4th most challenging mountain airport by the Aircraft Owners and Pilots Association (AOPA). The main reasons cited were the airport's mountainous location, the runway, and the unpredictable wind gusts, which caused a crash in 2007. In 2004 a Cessna crashed into an apartment near the airport due to engine problems. Outdoor recreation opportunities in Glenwood Springs abound; many visitors choose to have their experiences arranged by an outfitter. Activities include whitewater rafting, kayaking, caving, cycling, rock climbing, horseback riding, all-terrain vehicle (ATV) tours, off-road Hummer tours, Segway tours, tandem paragliding flights, world-class fishing, and lodge stays in Glenwood Canyon. Glenwood Springs lies about 45 miles (70 km) north of Aspen and 60 miles (100 km) west of Vail. There are 6 world-class ski resorts in this triangle: Aspen Mountain, Snowmass, Aspen Highlands, and Buttermilk in the Aspen area and Beaver Creek and Vail Mountain in the Vail area. There is also a family ski resort, Sunlight Mountain, 10 miles (16 km) from town. Another ski area, Red Mountain, existed until the mid-1900s. Some of the ski lift towers can still be seen. Nowadays the old service road acts as a hiking trail. Two rivers, the Colorado River and Roaring Fork River, converge in Glenwood Springs. Both are used extensively for recreation by locals, visitors and commercial outfitters. The waters of the Roaring Fork are "Gold Medal" fishing waters. The two raftable rivers makes the experience fun for any skill level. The Roaring Fork river provides a tame float trip with very few class 2 rapids. The Colorado River trip starting at Grizzley Creek is also a tame class 2 float trip fun for anyone. Running the Colorado From the Shoshone put in provides an amazing experience for the thrill seakers with its upper class 3 rapids is perfect for any adrenaline junkie. Glenwood Springs is an amazing place to try your first paragliding experience or if you are already a pilot it is an excellent place to fly. With three launches on two different mountains in town and five more sites less than 40 minutes away, Glenwood Springs makes a premier home base for the experienced pilot. The 16 miles (26 km) long recreation trail through Glenwood Canyon is sandwiched between the canyon walls and the Colorado River. It is suitable for families and recreational riders, with several access points and rest areas along the way. Bike rentals and shuttles are available at several outfitters in town. There is a paved loop along the Roaring Fork River that takes you from one end of town to the other and back again. The Rio Grande trail runs roughly 41 miles (66 km) from Glenwood Springs to Aspen along the railroad tracks of the former Denver and Rio Grande Western Railroad. The Glenwood Caverns Adventure Park is a small amusement park that is fun for all ages. A tram takes visitors up to what was formerly called the "Fairy Caves", now known as the Glenwood Caverns. The Glenwood Caverns is an incredibly complex cave system that travels throughout the bowels of Iron Mountain. A guided walking cave tour will take you through the cave system to see places like Kings Row, the most highly decorated cave room in Colorado and the Barn, the second largest cave room in Colorado. The Park also includes rides like North America's first Alpine roller coaster, and a Screamin' Swing called the "Giant Canyon Swing", which swings riders out over the edge of Glenwood Canyon, looking down at the Colorado River 1,300 feet below. The most recent addition to the park is the cliffhanger roller coaster. This coaster, added in 2013 is located near the top of the mountain and sits near the edge of a cliff. The Glenwood Vaudeville Revue is a two hour family fun dinner theater show with professional talent performing a variety of comedy skits, jokes, high energy dance numbers, unique novelty songs and original comedic presentations that are guaranteed to entertain, and help you laugh your worries away; and all this while you savor a meal prepared by many of the Glenwood Springs best restaurants. John Goss has spent the last 25 years performing in small theatre and melo- dramas ranging from Cripple Creek, CO to Denali, AK where he created and ￼￼￼￼￼￼“I havent laughed that hard in years!” ￼￼￼directed a number of vaudeville type revue shows. In our shows this year, John and the talented cast have put together some of their best material to bring you a wonderful variety of comedy, song and dance numbers that will have you saying, "Wow! I've never seen that before". Come see us! You'll have a great time! All of our shows are entertainment at its finest and have received great reviews; and this year is sure to please young and old alike. As usual, this summer we have new and original material including: An all New Rap, Gary's Dramatic Readings, More Babies and all New Jokes, Gags, Skits and Bits. 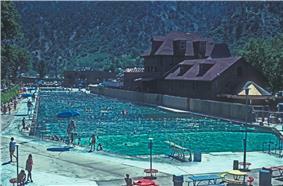 Glenwood Hot Springs is a premier Colorado Hot Springs resort. The large pool is kept at a comfortable 93 degrees Fahrenheit year round and is the world's largest hot mineral springs pool. The smaller "Therapy Pool" averages 104 degrees Fahrenheit year round is known for its healing minerals. There is a 107 room lodge, which includes unlimited access to the hot springs and a full hot breakfast for all guests. Spa of the Rockies is an award winning mineral spa that specializes in natural, mineral based treatments. Other amenities include a full service athletic club, gift shop and restaurant. Two waterslides, mini golf, and a cold water kiddy pool are open during the warmer months. Yampah Hot Springs vapor caves are historic underground steam baths. They are over 100 years old and were used by the Ute Indians as a source of rejuvenation and healing. Today, the vapor caves consist of three adjoining underground rock chambers. Cave temperatures average 110 to 112 °F (43 to 44 °C). The hot springs and mineral caves are tourist attractions and were a main reason for the settlement of Glenwood Springs. Glenwood is located in a valley surrounded by mountains, this unique geography provides hundreds of miles of off-road trails minutes from downtown Glenwood Springs. The most popular trail near Glenwood Springs is called transfer trail. This trail starts on the base of Iron Mountain and travels on the flat tops going near many pristine mountain lakes and hidden caves. Glenwood Springs has many different festivals and markets throughout the year. One of the most popular is the Downtown Market. This farmers market occurs every Tuesday throughout the summer months. Vendors display their locally grown and Colorado made products. Many great cooking demonstrations are held throughout the summer teaching people how to cook with fast, delicious, fresh and healthy foods. Another great reason to visit the Downtown Market is the free music played throughout the 14 week season. Sarah Schleper — Alpine skier. ^ Michaud, Stephen, and Hugh Aynesworth. The Only Living Witness. Authorlink 1999, paperback. ISBN 1-928704-11-5. p. 212-213. ^ "General Climate Summary Tables - Glenwood Springs, Colorado". Western Regional Climate Center. Retrieved December 17, 2012. ^ "Amtrak Colorado FY13 Fact Sheet". ^ "Greyhound System Timetable". Retrieved 31 May 2014.